Another Awesome Freddy Moran Class! Two weekends ago I was at a Zig Zag class taught by Freddy Moran at one of my local quilt shops, the Cotton Patch. Freddy was my first quilt teacher and I have taken 8 to 10 classes with her over the past 8 years. Every class with Freddy is such a blast. I think it’s a combination of her stories – she’s got loads of them – and how interactive she is throughout the class. She is always interested in seeing what we are making during the class and is constantly sharing our projects with the other members of our group. Plus she is really funny and totally makes me laugh! For this class, there was lots of cutting needed because the entire quilt is made up of squares. I went a bit overboard on my cutting and have enough squares for at least 6 quilts. Yee gads!! I have between 45 to 60 different fabrics cut for each color (except black)! I think I spent a total of 24 hours cutting squares. I decided to try something a little different than the class sample in that instead of using a solid color for the background, I decided to use my assortment of “whites”. As I started sewing the squares together, I got a little worried that this may not have been a good plan. I wanted to see if I could make the zig zag pattern show up but be a bit more subtle. At the same time, I really wanted to use a massive amount of different fabrics just for the fun of it. However during our class, the more squares I sewed together, the more skeptical I got. I kept telling my table mate that perhaps my idea had run amuck. Freddy didn’t say anything – she just smiled and said keep going and then we’ll take a look at it. Well okey-dokey I said. So I kept going. Once I got a few rows put together, we decided that it did work after all. It was definitely more subtle, but you could see the zig zag. I even surprised myself given how it looked before I sewed a bunch of the blocks together! This is a work in progress, I have one more row to add and then it will be done. Now I think it would be really fun to make this as a two color quilt as well. Maybe red and yellow, or red and green for the Holidays? Hmmm. I’m a Freddy fan too…but don’t know if I would have had the patience for all those squares! LOL!! Yours came out absolutely wonderful! What was the name of the class? I really like your quilt and am trying to imagine it with the solids rather than the whites that you used. I like scrappy quilts so yours fits the bill for being scrappy. Hi Diana, the name of Freddy’s class is Zig Zag. She told us that she got the idea from a quilt hanging at a recent show. She really liked it so she took a photo of it and then made the quilt from the photo. There is also a very similar pattern in Sarah Fielke’s book Hand Made with Love. (I think that is the right title.) Anyway, I think a plain white background would look great! I can’t believe how many squares you cut! Wow! I love the subtlety of your zig-zag. Tee-hee! I just kept cutting and cutting so that I would have a lot of variety! Now I need to use them all! Great collection of fabrics, The quilt top is looking great. I love how you took a risk and stuck with it. Your quilt is probably far more interesting than it would have been with one background. I struggle with trusting myself sometimes. 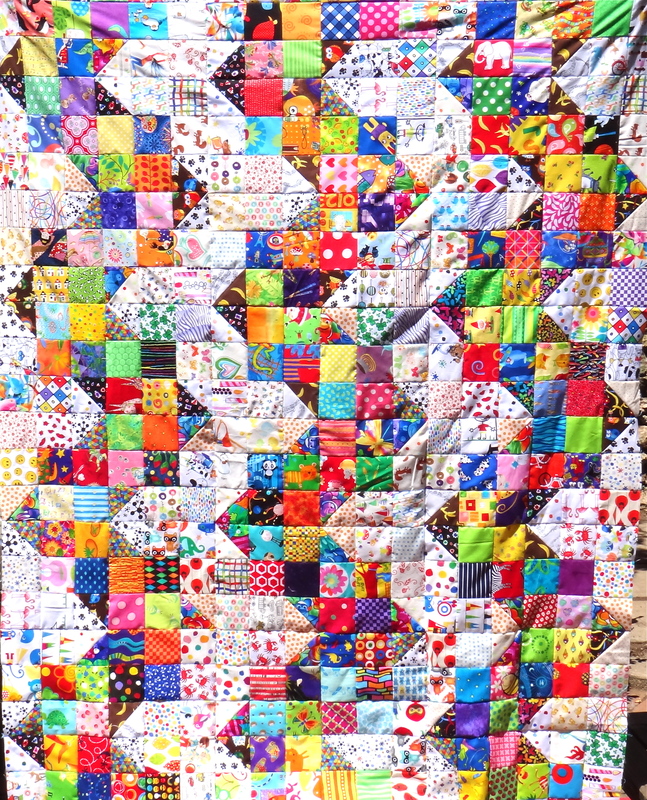 I quit the scrappy trips after 3 blocks because I just couldn’t envision the whole quilt! Thanks Greg 🙂 I usually have a general picture of what I am trying to do but sometimes that just changes as I go. I love the scrappy look because I can use tons of different fabrics and have to worry less about things going together. I think it would be really fun to see you do a scrappy quilt! I love the fabrics you use – so it would probably end up gorgeous! If not, you can make it into a cat blanket!